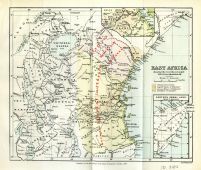 Title: EAST AFRICA showing the recently-arranged POLITICAL BOUNDARIES. Notes: Associated with book ID 783. Published for the Proceedings of the Royal Geographic Society, 1887. There are two insets" one towards the upper right corner, showing an overview of the Geja, Nguru, Uzeguha, Uzaramo and Usagara regions; and another inset in the right bottom corner and titled "Eastern Somal Land" at scale 1:16,000,000.